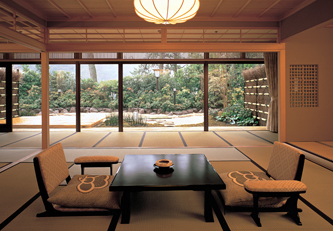 In general, the guestrooms of the ryokan are washitsu (Japanese-style rooms). You can relax comfortably in any style you like in the washitsu which mainly consists of a wooden ceiling and pillars, walls and tatami mats. In the middle of the main room, you will find a low zataku table, and zaisu (legless chairs) with zabuton cushions placed on top. In the deluxe guestrooms, arm rests called kyosoku are placed by the zaisu chairs. The guestroom has large, wide windows, so that the guests can enjoy panoramic views. When the sunlight pouring in is too bright, you can close the shoji (sliding screen) made of wood and paper which will soften the light. Some guestrooms have wood-framed glass sliding doors instead of windows, allowing the guests to step out into the garden straight from their rooms. The wooden-floor space outside the tatami-matted room is called engawa (veranda-like porch). When stepping down from the engawa into the garden, you are to wear geta (Japanese wooden clogs) or setta (leather-soled sandals). In recent years, it is quite common to find guestrooms with a modern living room designed in a blend of Japanese and Western styles. The fusion of Japanese and Western styles can even be found in the bedroom. In the case of washitsu, bedding (futon) is usually directly placed on the tatami, but low beds are used in the place of futon at some ryokans. In some cases, the bedroom is designed in Western style. Even in Western-style bedrooms, you will frequently find elements of Japanese-style interior design incorporated. Tatami mats of the ryokan are changed into new tatami-omote (coverings) at regular intervals. The fresh green tatami gives off a gentle aroma that is unique to the raw rushes used to make tatami. Glass sliding doors Elements of Japanese-style interior design Enjoy the outdoor scenery!